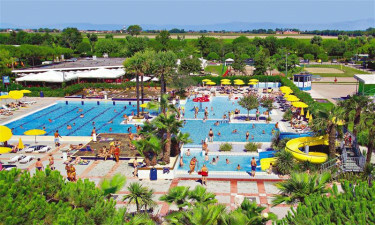 Porto Felice is a holiday camping site found only 50 kilometres from Venice. It offers a truly unforgettable experience for anyone who is satisfied with nothing less than unsurpassed luxury. Please speak with an expert at LUX-Camp to learn more. Why Should I Camp at Porto Felice? 350 tourist pitches to choose from. Clean and spacious mobile homes. An immaculate setting amongst the pines of Eraclea Mare. This luxury camping site has left nothing to spare in terms of comfort and on-site accommodations. A welcoming open-air pool is found within its confines, which is then flanked by two large hot tubes. The pool varies in depth and water slides enable this small water park to be perfectly suited for children. There is also direct access to a nearby beach for anyone looking for surf and sand. Some of the on-site facilities include baby changing rooms, free Internet access, waste disposal centres and a full laundrette. It is worth noting that all of these locations can be accessed by those with limited mobility. Camping in luxury is further enhanced thanks to the presence of an on-site restaurant-pizzeria. Guests can enjoy a wide range of foods while traditional Italian cuisine is always a possibility. Guests can choose to dine in the fresh air although there are also takeaway menus available. Portofelice provides various shopping opportunities in the form of a supermarket, a souvenir shop and a quaint bazaar. Common groceries are available while international newspapers, tobacco products and keepsakes are perfect gift ideas before leaving this holiday camping site.